To appreciate the text on this stein it must be understood that the tomcat (Kater) is both a German symbol and idiomatic expression for a hangover; pickled herring an alleged cure. 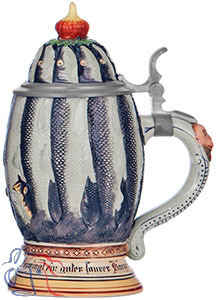 This stein was reproduced by Merkelbach throughout the history of the company and by Thewalt, circa 1990, as model No. 1296.